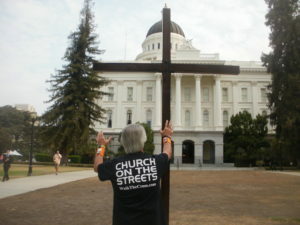 Street Evangelist Tom Alexander Hoisting The Large Cross Upright And Praying At Compton's City Hall. Since 1973 (when I became a believer) I have always wanted to go to Compton and share the Gospel. Now, after a successful cross walk in East L.A. and downtown Los Angeles, here I was. Walking the large cross on the sidewalk running parallel with Compton Avenue, I immediately was taken back by the friendliness of all the people passing by in vehicles, as well as the large number of believers.